Spilhaus CRS is located about 9km from UZCHS-CTRC’s core administrative offices in Harare. 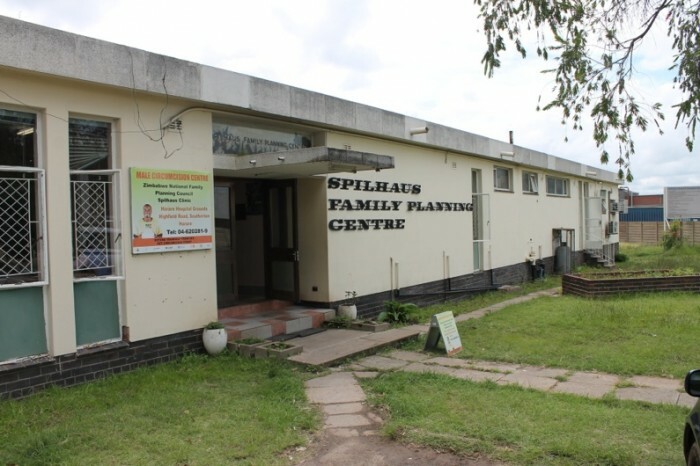 The CRS is housed at the Zimbabwe National Family Planning Council (ZNFPC) Clinic, within the grounds of Harare Central Hospital, 1 of the 4 largest referral hospitals in Zimbabwe. Harare Central Hospital serves the city’s 13 densely-populated suburbs, and is easily accessible by public transportation. ZNFPC sees an average of 7,000-10,000 adolescent, adult, and post-menopausal women annually, and provides family planning services, diagnosis and treatment of sexually transmitted infections/reproductive tract infections (STIs/RTIs), cervical cancer screening, sub-fertility investigations, and HIV screening. On average, the clinic sees 500 patients for HIV testing each month. The majority of these referrals are from City of Harare’s 15 primary health clinics. The ZNFPC Clinic is also a center for Medical Male Circumcision (MMC), with an average of 600 MMCs are performed monthly. Since the establishment of the CRS in 1994, 13 protocols with a total enrollment of 17,000 women have been completed at the site. Throughout this period, there has been increasing diversity, experience and efficiency of research staff, and infrastructure to meet the evolving needs of the trials. In the past 6 years, the CRS has enrolled over 600 participants in 6 clinical trials, and has the capacity to manage up to 600 participants annually, across multiple clinical research protocols. Cervical Cancer Screening: In Zimbabwe, cervical cancer is the most common cancer in females, and accounts for 30% of all registered cancers in women and 80% of gynecological cancers. Against this backdrop, Spilhaus CRS has established a cervical cancer screening and treatment program as part of standard care for all study participants. 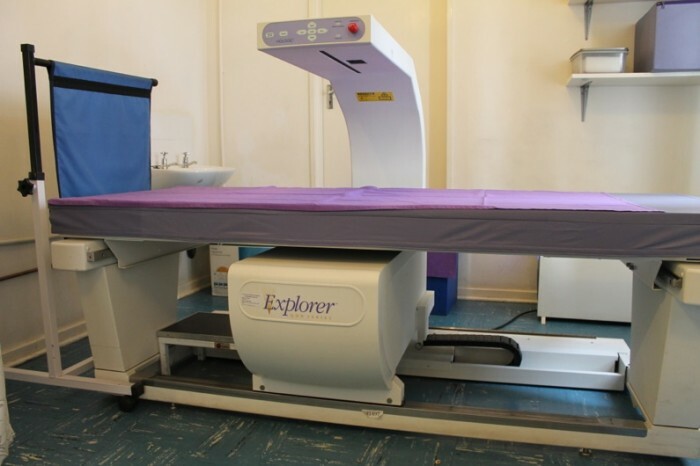 The colposcopy room has a state-of-the-art colposcope and LEEP treatment machine. The equipment is connected to a teaching monitor, digital imaging equipment, and a computer. The computer is Internet connected to transmit participant information and images. This equipment creates many opportunities for the site to be involved in cervical cancer screening and treatment protocols. All women (across UZCHS-CTRC protocols) with abnormal cervical cytology (Pap smear) results are referred to this site for further management. Bone Mineral Density (BMD): The CRS has a Hologic QDR-4500c BMD scanner, which uses modular, fan-beam DXA technology to scan spine, hip, and forearms. It also has a package of clinical, patient reporting, and support software. It uses a computer system and printer, modem, SuperDisk drive, and CD ROM. It is connected to the Internet for transmission of scans and data to the SDMC for data analysis. There are 3 trained BMD scan technicians and a backup radiographer. The BMD scanner provides Spilhaus CRS with an opportunity to conduct studies to assess bone mineral density and provides much needed data on participants on ARV regimens, who may be at risk for bone demineralization. The CRS has excellent support from a DAIDS-certified satellite laboratory that is temperature controlled by an air-conditioner with continuous monitoring by a data logger, and a connection to the back-up power supply when necessary. It is equipped with a double sink, an eye wash station, 9 cubic foot refrigerator, clean and dirty workbenches, shelves, sharps boxes, and fire extinguisher. There is also a centrifuge, incubator, maximum/minimum thermometers, insulated cooler bags, micropipettes, and timers. The laboratory performs on-site testing including HIV-rapid tests, urine pregnancy tests, microscopy (stool, urine, wet mount preparations), and process specimens for transportation to the Central Laboratory for analysis and storage. Staffed by a laboratory scientist, specimens from up to 20 participants can be received and processed each day. For more information on our centralized testing capacity, please see our Central Laboratory page. The CRS is also supported by its on-site DAIDS approved pharmacy, where study product is stored and dispensed along with primary care drugs. Staffed by a Pharmacist of Record (PoR), a back-up pharmacist ,and a pharmacy technician, up to 20 participants can be served daily. The temperature-regulated and secure environment is suitable for storing temperature-sensitive medications for multiple protocols. Spilhaus CRS’s pharmacy is licensed by the local regulatory body, Medicines Control Authority of Zimbabwe (MCAZ), as a Clinical Research Pharmacy. For more information on our centralized pharmacy please see our Central Pharmacy page. For inquiries related to Spilhaus CRS and the research it conducts, please contact Site Leader, Felix Mhlanga, MBChB, MMed.